June 4 marks the start of the 16th annual Sacred Music Festival, fesfestival.com, in Fez  Morocco's culinary and artistic HQ. This year's headliners include everyone from American indie luminary Ben Harper to jazz saxophonist Archie Shepp to poets from Afghanistan, Mongolia and Iran, who'll perform along with whirling dervishes and Sufi transcendentals within and beyond Fez's ancient Medina. Of course music is hardly the only allure of this city in the Atlas Mountains. The old walled city of Fez has been declared a UNESCO World Heritage Site and its thousands of labyrinth-like alleyways are a cultural and architectural trove. Here are five of the city's must-sees and must-dos. Located between Fez and the royal city of Meknes is Volubilis, one of the most important Roman antiquities sites in the Maghreb and home to a new historical museum designed by Moroccan-American firm Kilo Architecture. Perched within sighting distance of the ruins themselves, Kilo's slim, angular galleries display artifacts from Volubilis and other important sites. While the museum is certainly stunning, Volubilis' 2,000-year-old ruins are obviously the real draw  a fascinating assemblage of granaries, villas, colorful mosaics and a monumental basilica. See sitedevolubilis.com. Since its debut in the heart of the Medina, Café Clock, cafeclock.com, has emerged as a center of Fez's cosmopolitan social swirl. Opened by Briton Michael Richardson  former maître d' at London's posh Ivy  the café takes its name from the nearby Dar al-Magana  a house containing an elaborate 14th century water clock. Café Clock's terraces, sitting rooms and rooftop perch are the setting for weekly film screenings, beginner Arabic classes, cooking classes and traditional music recitals. Its Moroccan inspired fare, from almond and chicken couscous to a camel burger with fries, is equally enticing. Fez's once vibrant Jewish community may be long gone, but their legacy lives on in their former ghetto. Established in the 15th century, the Mellah is a warren of wooden-balconied homes around the now restored Ibn Danan Synagogue  one of Judaism's most intriguing monuments. Visit the Mellah to shop at tiny antiques boutiques (close to the Jewish cemetery) for the city's best collection of vintage furniture, decorative pieces and other objets d'art. 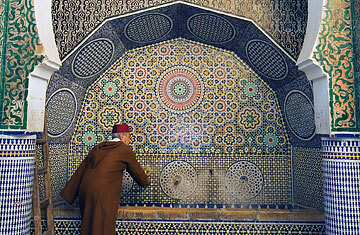 Watch TIME's video "Financial News in Old Fez."